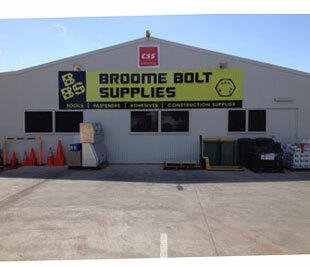 Broome Bolt Supplies supply a wide range of fixings, fasteners, power tools, tradesman tools, leather work wear, safety gear, drill bits, taps, cutting and grinding accessories, balustrade supplies and much much more. We can even get you a white elephant from India if that is what you really want! Our motto simply is ...you want it, we will get it. Based in Broome, we currently service the Kimberleys Pilbara areas of Western Australia and pride ourselves on being the best at what we do in the area. We are supported by some of Australia’s largest and best known supplier based companies and are building a wonderful reputation for providing quality product backed the very best in after sales service and technical advice.